The NOAA Climate Normals are a large suite of data products that provide users with many tools to understand typical climate conditions for thousands of locations across the United States, including the 30-year normals, 5, 10, 15, 20-year normals, agricultural normals, and others. For nearly 100 years, the 30-year NOAA Climate Normals have been a premier NOAA product of 30-year-averages of meteorological parameters. The 1981-2010 Climate Normals Product Suite has been expanded to meet more user needs and requirements spanning many different industries, including agriculture, heating and cooling, construction, and others. To ensure both quality and completeness, hundreds of NWS stations meeting stringent criteria are used, including those from NWS's Cooperative Observer Program (COOP) Network, some additional stations are included in the Supplemental Climate Normals for 1981-2010. More information about the Annual/Seasonal Climate Normals Products accessible through Climate Data Online. More information about the Monthly Climate Normals Products accessible through Climate Data Online. More information about the Daily Climate Normals Products accessible through Climate Data Online. More information about the Hourly Climate Normals Products accessible through Climate Data Online. More information about the Supplemental Climate Normals Products, including documentation specific to the Supplemental Products. Climate normals are computed for the 30 year period from 1981 to 2010 for U.S. stations. Values include degree days, snowfall, frost/freeze dates, climate probabilities and statistics. Supplemental Normals are computed to meet specialized user needs, including the agricultural, energy, and construction sectors. Complete station listing of all stations used in the 1981-2010 Climate Normals. Station listing of all stations used in the 1981-2010 Climate Normals for snow products. Station listing of all stations used in the 1981-2010 Climate Normals for snow deproducts. The 1971-2000 Climate Normals have been superseded by the 1981-2010 Climate Normals. Users should not use the 1971-2000 Normals except in rare cases. 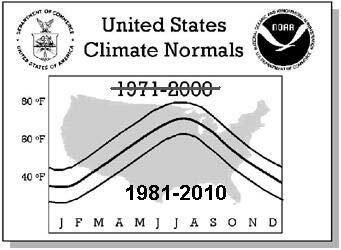 For more information on the generation of the 1981-2010 Climate Normals, please see associated documentation. 2015-08-17T00:00:00 - 2015-08-17 - 30-year Hourly Normals replaced and two new Supplemental products released: the 10-year Hourly Normals and the Air Freezing Index Product. For more information, please refer to documentation. A snapshot of ISD-Lite was taken in order for users to reproduce the files. Please click the link to download the data file. A snapshot of GHCN-D was taken in order for users to reproduce the files. Please click the link to download the data file. All available source data is available from this link, including associated documentation for standalone and interim datasets. Description of Source: In addition to standalone products such as GHCN-D and ISD-Lite, interim datasets were produced during the generation of the Climate Normals. For convenience, these interim data collections are available. Please review documentation for more information.